For the basketball player, see Nenê. 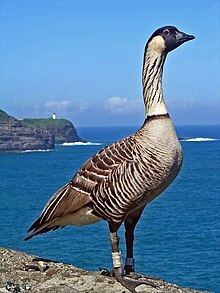 The Nēnē, or Hawaiian goose (Branta sandvicensis) is a species of goose. It is found today on only three Hawaiian islands. It gets its name from its soft call. This is an unmistakable species, with its generally brown plumage (feathers) and darker head. Its strong toes have much reduced webbing (skin between the toes), an adjustment to the lava flows on which it breeds. The Nēnē goes about on land much more than other water birds. When moulting (dropping old feathers and growing new ones), the Nēnē cannot fly, as do other geese, a factor which made it vulnerable to hunting. The Nēnē was once among the most threatened waterfowl species around the world. Once common, hunting and predators brought to the islands such as mongooses, pigs and cats reduced the population to only 30 birds in the 1950s. However, this species breeds well in captivity (zoos and bird parks), and has been successfully re-introduced. There are also good numbers in wild bird collections. The Nēnē is the state bird of Hawaii. ↑ BirdLife International (2012). "Branta sandvicensis". IUCN Red List of Threatened Species. Version 2014.2. International Union for Conservation of Nature. Retrieved 29 November 2014. ↑ 2.0 2.1 "BBC - Wear - Rare bird lays first spring eggs". news.bbc.co.uk. Retrieved 22 March 2010. ↑ 3.0 3.1 "Hawaii State Bird - Nene - Hawaiian Goose". 50states.com. Retrieved 22 March 2010. ↑ "Hawaiian 'Nene' Goose Facts, Figures, Description and Photo". ducks.org. Retrieved 7 April 2011. This page was last changed on 10 September 2018, at 09:58.